United States. Department of Agriculture; United States. Department of State. 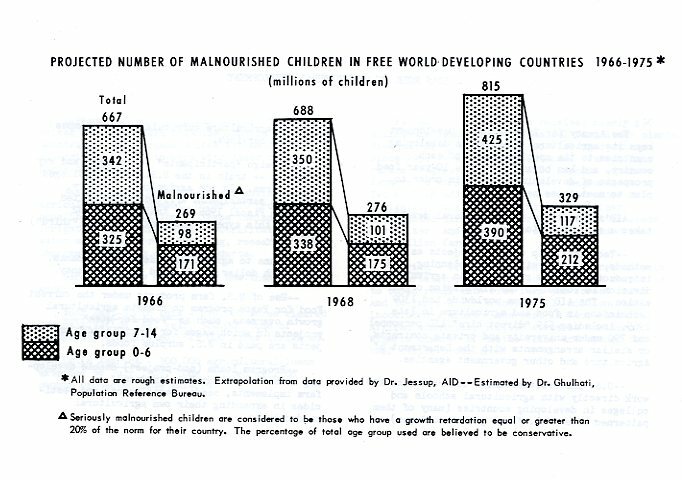 "'Projected Number of Malnourished Children in Free World Developing Countries 1966-1975' graph." W. R. Poage Papers, Box 32, File 11, Food for Freedom, Agency for International Development, Departments of State and Agriculture, February 10, 1966, booklet, W. R. Poage Legislative Library, Baylor University, Waco, Texas.. Accessed 20 April 2019. http://acsc.lib.udel.edu/items/show/133. W. R. Poage Papers, Box 32, File 11, Food for Freedom, Agency for International Development, Departments of State and Agriculture, February 10, 1966, booklet, W. R. Poage Legislative Library, Baylor University, Waco, Texas.